In 1982, Rabbi Adam Spilker was a kid visiting Paris when he first saw the Notre Dame Cathedral. He remembers gazing at two allegorical figures flanking the main entrance: “Synagoga” and “Ecclesia” — the Synagogue and the Church. “Synagoga representing the Jews is a female figure that is bent, with a broken staff symbolic of a broken covenant. In contrast is Ecclesia, also a female figure, representing Christianity that is upright and triumphant,” Spilker explained Dec. 2 before a crowd of 300 in Minneapolis. When he saw the ubiquitous medieval motif, however, he understood the figures as a vestige of history, not representative of the “harmony between Catholics and Jews” in which he was growing up. Spilker, rabbi of Mount Zion Temple in St. Paul, credits the shift to “Nostra Aetate,” a Vatican II document that laid a foundation for a positive relationship between the Church with non-Christian religions. That relationship was recently made visible, Spilker noted, with a newly commissioned statue — blessed by Pope Francis — on the campus of St. Joseph’s University in Philadelphia showing Synagoga and Ecclesia sitting side-by-side as if in a conversation, with Synagoga unrolling a scroll and Ecclesia holding an open book. It was commissioned for the 50th anniversary of “Nostra Aetate,” the milestone that also occasioned the banquet where Spilker spoke Wednesday night. 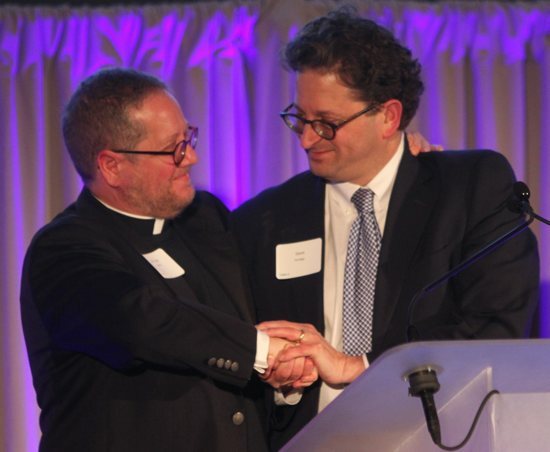 Held at the Renaissance Minneapolis Hotel, the event commemorating “Nostra Aetate” was hosted by the Archdiocese of St. Paul and Minneapolis with the state’s other dioceses, the Jewish Community Relations Council, the Minnesota Rabbinical Association and the Jay Phillips Center for Interfaith Learning, a collaborate enterprise of the University of St. Thomas in St. Paul and St. John’s University in Collegeville. The evening’s Catholic speakers were Father Erich Rutten, chairman of the archdiocesan Commission on Ecumenism and Interreligious Affairs; Father Theodore Campbell, a retired priest and former pastor of Good Shepherd in Golden Valley, whose parish school has a longtime relationship with a nearby Jewish day school; and Archbishop Bernard Hebda, the archdiocese’s apostolic administrator. “It was immediately recognized as a powerful shift, and it’s led to renewed dialogue and renewed relations among all faiths” including in Minnesota, he said. Keynote speaker Amy-Jill Levine employed humor to relay a serious and formative incident, underscoring the way “Nostra Aetate” changed the Catholic understanding of the Jews. The event predated “Nostra Aetate,” she said, but it was also her first experience with Jewish-Catholic relations. It was the only anti-Semitic comment she heard as a child. “Nostra Aetate states: “Since the spiritual patrimony common to Christians and Jews is thus so great, this sacred synod wants to foster and recommend that mutual understanding and respect which is the fruit, above all, of biblical and theological studies as well as of fraternal dialogues. Levine was curious about where the origins of the idea that Jews killed the Christians’ God and was eager to stop it, so she decided to attend catechism classes with her friends. Now she is a professor of New Testament and Jewish studies at Vanderbilt University Divinity School in Nashville, Tennessee, and a member of an Orthodox Jewish synagogue. She gave an overview of successes as well as continued challenges in Jewish-Catholic dialogue. She also called for Christians and Jews to better understand each other’s Scriptures and traditions, similarities and differences, and she challenged bishops to arrange programs on preventing anti-Jewish teaching within Catholic institutions and catechism programs. She also asked Jewish leaders to do the same for Christian teaching in their institutions.